The Shaw’s Road project started this past week and plans are underway to upgrade the road, according to the Public Works Department. The road project stretches from the island main road in New Castle to Fountain and spans an estimated two miles. Raoul Pemberton Director of the Public Works Department told the media on Monday that the project will be done in two phases. “One from the island main road to Mount Nevis, second from Mount Nevis to the Fountain play field. We will be adding drainage, proper compaction and the finally the asphalting of the road, he said. Manager of the Water Department Roger Hanley also revealed what will be done in terms of water and supplying it to residents now and in the near future. 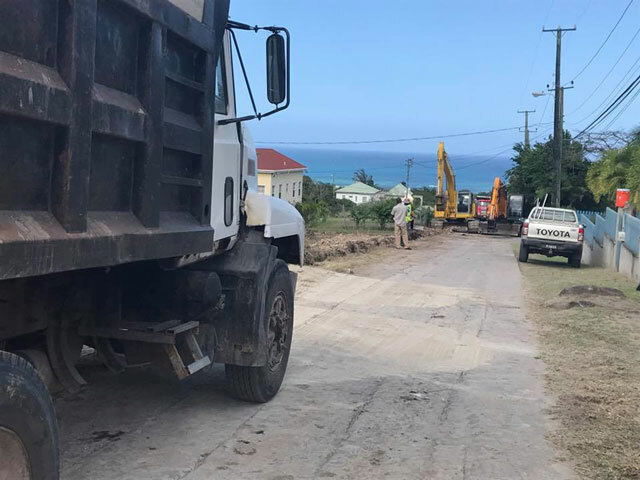 “ We are upgrading to the water mains and basically the project will be done in two parts , from the intersection at Mount Nevis down to the island main road we will be installing four inch pipes as well as we will be installing firefighting devices . The other section is from the intersection at Mount Nevis up to Fountain Village. We hope to install six inch mains and this is in keeping with future demands in the area and potential water use,” he said. The Junior Minister in charge of works Hon Troy Liburd noted that the project should be completed by the end of this year. “It is a very long project, but we are hopeful that we will get through really quickly. We expect that there will be some disruption in terms of traffic and other things. We will be deploying dust control measures but we are aware that there will still be some limited amount of dust,” he said. Mr. Liburd asked residents for their continued understanding as the government tries to improve their lives. Shaw’s Road is one of many projects scheduled for this year. according to the minister in charge of roads the Hon Alexis Jeffers who previously spoke with The Observer. Shaw’s Road is being done first because it is much easier project to undertake at this point in time and the road will serve as a detour for motorist when the time comes to undertake the construction of major project at camps. Shaws Road- Goar hill, Camps-Mt.Lily-Fountain- WestBury , Barnaby, Garnas, Nisbett Settlement, Brick Kiln are villages that will be receiving new roads which are estimated to be completed at between $3 and $4 million. The road will be funded by using monies from revenue and Federal Government funds earmarked for various purposes. “The reduction in the cost of base material the roads should be built at 20% less than cost of what it was before,” said Liburd. The Housing and Land Development Corporation has been able to reduce the cost of rough base material from $190 to $25 per yard for rough material.